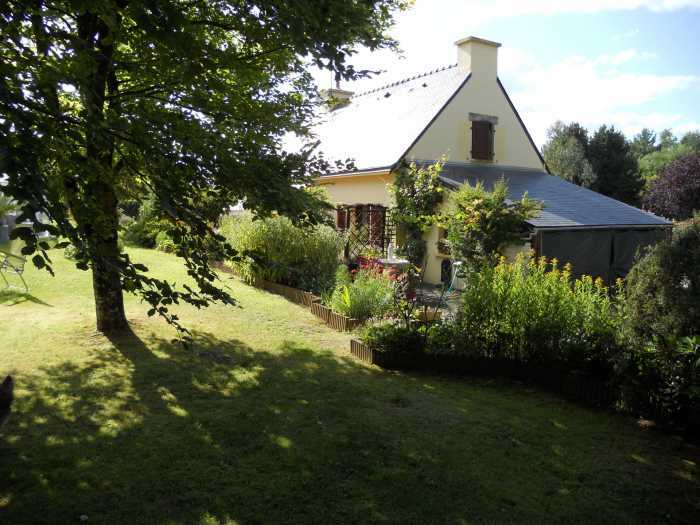 AHIB-1-DN-678 Mur de Bretagne 22530 Guerledan Lake region – 3-bedroom house with covered pool and 1 ¼ acres of mature gardens. The house was built in 1991 and offers on the ground floor; an entrance porch, a fitted kitchen open onto the lounge area with its fireplace and French windows onto the patio area. There is a small downstairs bedroom, a shower room and a toilet. Upstairs is a large landing area, two decent sized bedrooms and an upstairs toilet. The house was extended in 1996 to add a spacious veranda which has become the main living room in the property. To the rear of the house is the swimming pool with its telescopic cover and heated by an air heat pump. It measures 8,20m by 4,20m and with a depth of 1m to 1,8m and the liner was renewed in 2015. The property sits in 5000m² (1 & ¼ acres) of mature and enclosed gardens where you will find a multitude of varying trees and shrubs. The property is surrounded by hedges, has front gates and a tarmac drive.